Jim took two trips to Moscow in 1984 to plan and produce his show about Russian puppeteer Sergei Obraztsov for the Jim Henson Presents series. It was a wonderful experience, and while Jim was there, he met up with his friend John Denver and performed for children at the American Embassy. Accompanied by his daughter Cheryl who had spent the summer of 1982 in Russia, Jim had a very positive trip. By 1988, perestroika was in the air, and opportunities were opening up for broadcast collaborations. Mr. Rogers visited that spring and taped a segment for his program with characters from the classic Russian children’s show Good Night, Little Ones. 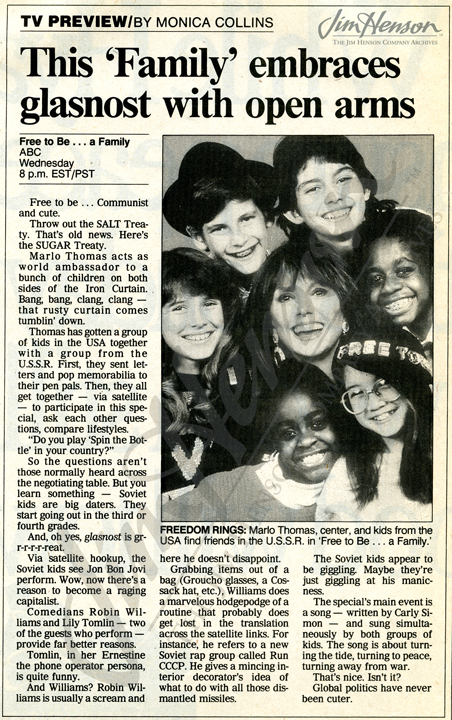 That summer, Chris Cerf, Jim’s Sesame Street colleague, started production on a show with Marlo Thomas called Free to Be A Family (following up from her 1970s special, Free to Be You and Me). The show was meant to encourage glasnost, connecting children in the US with those in the USSR by means of a “space bridge” (i.e. satellite link). Between the live segments (this was the first live entertainment television special produced jointly by, and in, the US and USSR), there was to be taped segments featuring Jim’s characters, Kermit and Miss Piggy, and the stars of Good Night, Little Ones, a pig named Khriusha and a rabbit called Stepashka. Jim taped his part in Moscow that August, accompanied by his daughter Heather, Kathy Mullen (who performed Miss Piggy), and Michael Frith. With post production and voice recordings in New York that fall, the show was ready to air in December. Jim was eager to establish relations with media organizations in the Soviet Union, inspiring an expedition by his international television distribution team (under the banner HIT – Henson International Television) to meet with people at the American Embassy and various divisions of Goskino, the state committee overseeing broadcast and home video. The Ministry of Culture was planning for 40% budget cuts, making them suddenly interested in selling commercial air time. They needed programming that would attract consumers and were very interested in The Dark Crystal and Labyrinth which had been screened at the Moscow Film Festival. They were highly interested in educational programming, and a second trip resulted in the sale of Fraggle Rock to Soviet television. Two minute clips aired that December to promote the show, and in January 1989, Fraggle Rock became the first American television series to appear on Russian televisions. By the end of the year, as the show’s lessons of tolerance and understanding wafted through the airwaves, the Berlin Wall came down. Free to Be A Family was not the first time Jim used his characters to help spread the American way. See Jim Henson’s PSA promoting democracy in the Dominican Republic created on behalf of the U.S. Information Agency in 1962. Press coverage of Free to Be A Family. 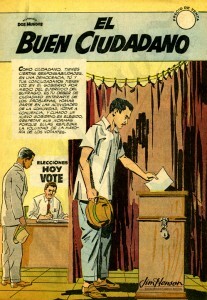 A USIA comic promoting democracy provided to Jim to help create a 1962 Public Service Announcement for the Dominican Republic. This entry was posted in 12-December '88, 1988, Jim Henson Presents and tagged American Embassy, Cheryl Henson, Chris Cerf, Dark Crystal, Fraggle Rock, Free to Be A Family, Free to Be You and Me, Good Night, Heather Henson, Henson International Television, John Denver, Kathy Mullen, Kermit, Khriusha, Labyrinth, Little Ones, Marlo Thomas, Michael Frith, Miss Piggy, Moscow, Moscow Film Festival, Mr. Rogers, Russia, Sergei Obraztsov, Soviet Union, Stepashka. Bookmark the permalink.